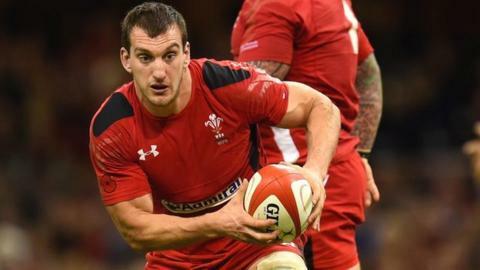 Captain Sam Warburton is relishing "being thrown straight into the deep end" when Wales host England in the Six Nations opener on Friday, 6 February. The open-side flanker and 2013 British and Irish Lions skipper, 26, says Welsh fans have been anticipating the match since November's Tests. "To be playing England first, from a player's point of view is brilliant," said the Cardiff Blues star. "Cardiff will be guaranteed to be bouncing all day." Wales lost to Australia and New Zealand in November and beat Fiji before going on to defeat South Africa for only the second time, in their last autumn game. "Since the November games a lot of the Welsh fans' attention turned straight away to the England game, which was two months away and for players that seems a long time away," said Warburton. "But there's already been a lot of focus and build-up to that match and the players can sense that just from the media interest, the public. "Walking around Cardiff and things it's one everyone's looking forward to. "It is a good way to kick off the Championship." Warburton added: "There's never a disappointing Wales-England game - I'm sure it will be a good opening to the Six Nations." England have suffered injuries to key players ahead of the Six Nations, with Owen Farrell ruled out for the entire campaign while Geoff Parling, Brad Barritt, Kyle Eastmond and Tom Wood will miss the trip to Cardiff. Wales, in contrast, have few injury concerns and Warburton says the squad is in good shape. "We've been pretty lucky this year with injuries, normally we have a couple of guys in key positions who might be struggling," Warburton said. "As long as we don't have any hiccups over the next couple of weeks we are in a good place... it is a nice place to be in."